When using the VIDEO4 and other RT hardware together, VIDEO4 acts as a source of data for other products and also receives data from other products. To ensure correct operation, the VIDEO4 must be configured correctly so it sends or receives data from other products at a suitable rate. "Data Configuration" dialog is used to configure the VIDEO4 to send or receives the messages to or from other RT products at correct rates. To open it click �Configuration� -> �Data Configuration�' menu item and select the "Data output and storage" tab. 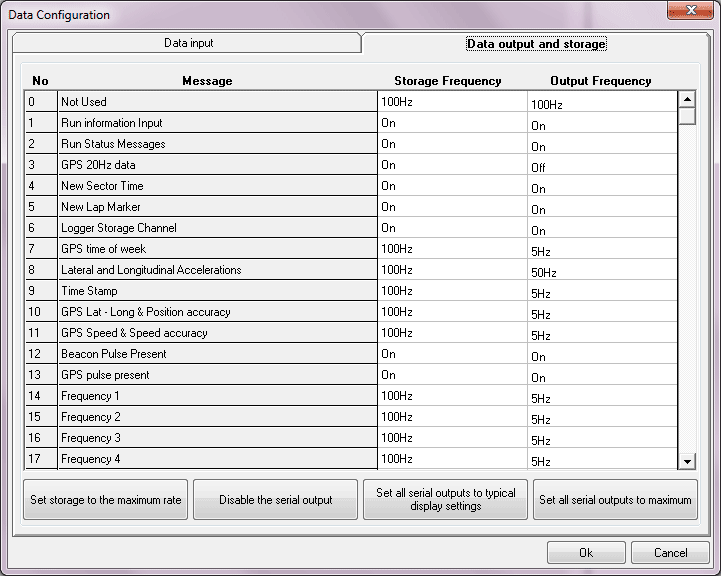 Two frequency settings for each and every message can be changed. Storage Frequency: This is the rate of saving RT messages to the disk file. These frequencies can be changed one by one to suit with the connected hardware. After making changes press OK to save them. For DASH products and RT Data loggers you can change the all output frequencies at once by using two buttons at the bottom of the dialogue. For more information on this please read following sections.